William Swanton was born around 1812 , in County Cork, Ireland. He was the son of John Swanton of Coppeen, County Cork . William Swanton married Julie Lyon(s) (possibly Lyne) in the Church of the Immaculate Conception in Enniskeane, County Cork, Ireland on September 23, 1838. The witnesses to their marriage were John Swanton and Anne Lyons. Julia and William were married by Father F. M. Haynes. Ann Swanton was born on September 23,1838. She was baptized in the Church of the Immaculate Conception in Enniskeane, and her baptismal sponsors were John Swanton and Ann Lyons. The oldest daughter is traditionally named after the mother's mother, but her name was Nancy. So perhaps Ann was named after her father's mother. Daniel Swanton was born in 1843. I wasn't able to find his baptismal record. He was named after Julia Lyons Swanton's father, Daniel. John Swanton was born in 1844. I wasn’t able to find his baptismal record. He was most likely named after his grandfather, John Swanton. William Swanton was born on April 20,1846. He was baptized in the Church of the Immaculate Conception in Enniskeane, and his baptismal sponsors were John Crowley and Mary Coffey. The third son is traditionally named after the father. George Swanton was born in February of 1849. He was baptized in the Church of the Immaculate Conception in Enniskeane, and his baptismal sponsors were John Lyons and Mary Donovan. The fourth son is traditionally named after the father's oldest brother. Sometime after 1850, William and Julia immigrated to the United States. On July 17,1860, William and Julia Swanton lived in the town of St. Albans, Franklin County, Vermont. Their ages on the 1860 Vermont Federal Census were recorded as William, 35, and Julia, 32. Their sons, William Jr., 10 and John, 8 lived with them. 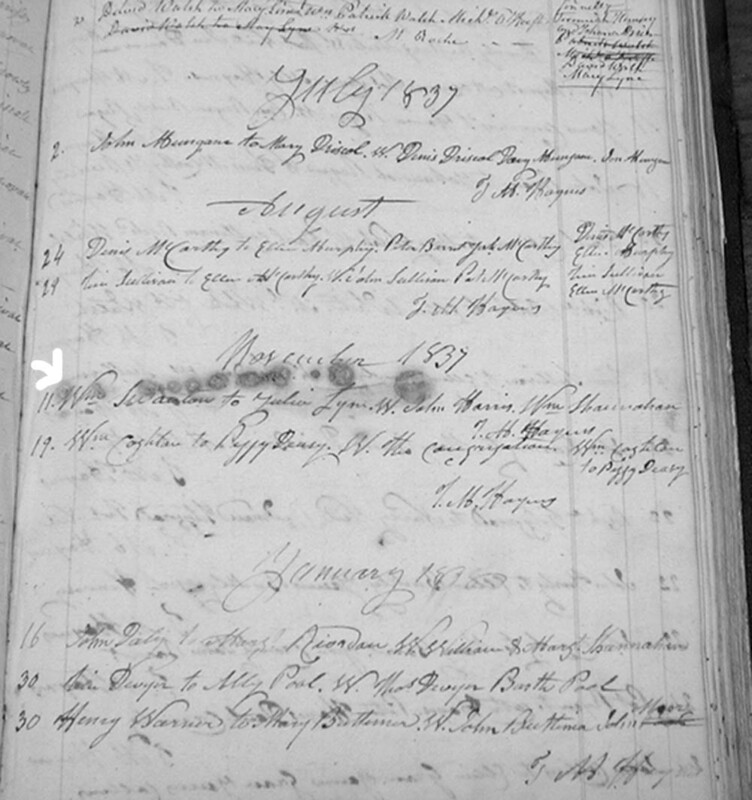 William Swanton’s occupation was listed as carpenter. William Swanton became a naturalized citizen of the United States on September 2,1880. His naturalization took place in the US District Court, Burlington, Vermont. The witnesses for his naturalization were J. B. Sullivan and James Scott. They swore that they had known William Swanton for at least the previous past five years, and they attested to his good, moral character and his belief in the principles of the Constitution. Ann Swanton, the daughter of William and Julia, married James Mullen on July 21,1863. 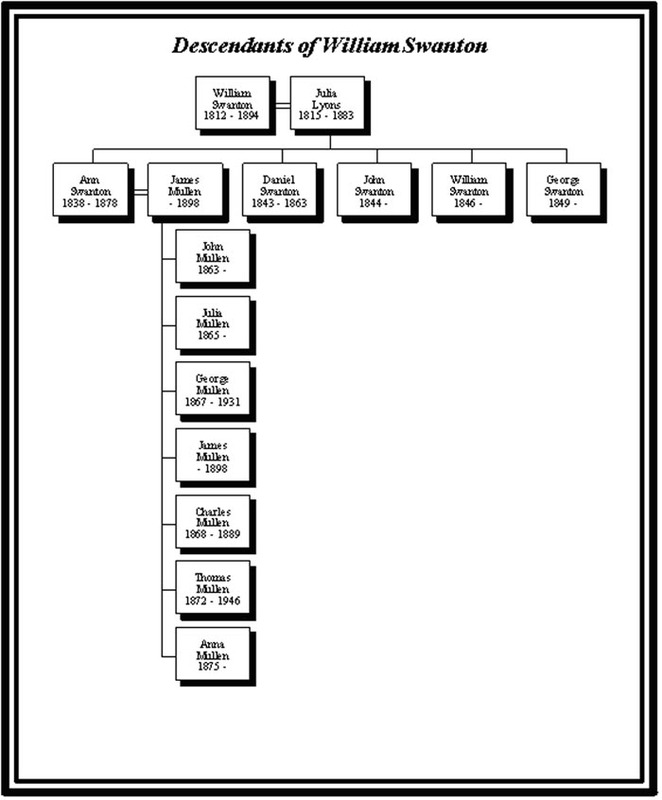 They had seven children: John, Julia, George, James, Charles, Thomas, and Anna. James Mullen died on May 6, 1898 and is buried at St. Mary’s Cemetery in Swanton, Vermont. His wife, Ann Swanton Mullen, died on May 7,1878 of consumption. I don’t know where Ann was buried - her name is not listed on the gravestone with James. William and Julia’s son, Daniel, died on September 25,1863 at the age of 15, Daniel Swanton is buried in Greenwood Cemetery in St. Albans, Vermont. 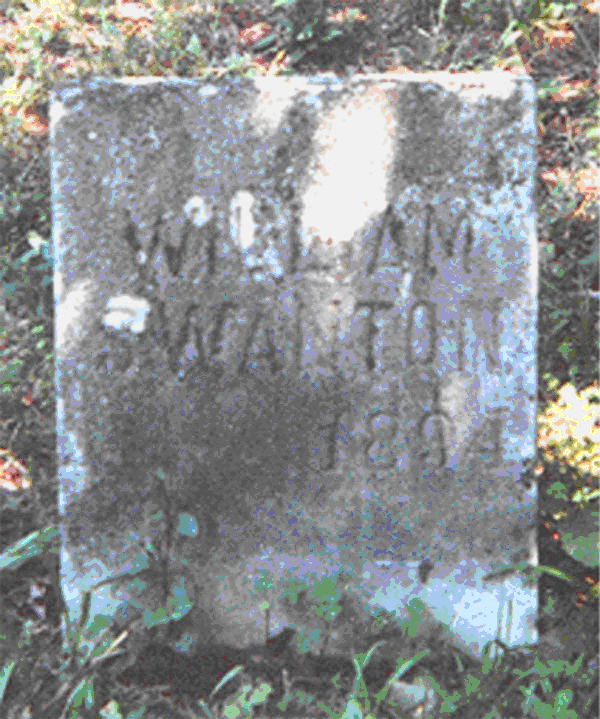 William Swanton died on February 24,1894 at the age of 82. His occupation was recorded as “pauper”, and he was buried in the Poor Farm Cemetery in Sheldon, Vermont. His gravestone is very rough and simple—it looks as though it was chiseled by hand. The inscription on the stone is “William Swanton 1894”. His death record didn’t give the name of his father. Julia Lyons Swanton died of heart disease on December 7,1883 at the age of 68.